The Pet Funeral Program Template is a ready-made pet funeral program invite that gives you an opportunity to mourn the loss of your special furry friend. It can be used by anyone who wants to honor the memory of their pet and create a beautiful funeral program that will cherish your love for your best friend. Every Pet funeral program template and pet memorial card listed here is created with an attention to detail that will help you remember the good old days with your pet. You can also see Funeral Program Template for a Friend. The soft blue textured background with a movable frame and bow looks elegant and classy. It is available in doc, ODF, Pub and Pages formats. 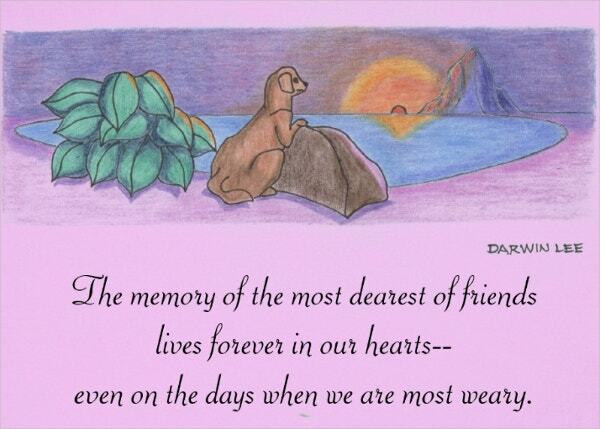 The template is great for sharing memories of your pet with friends and family. 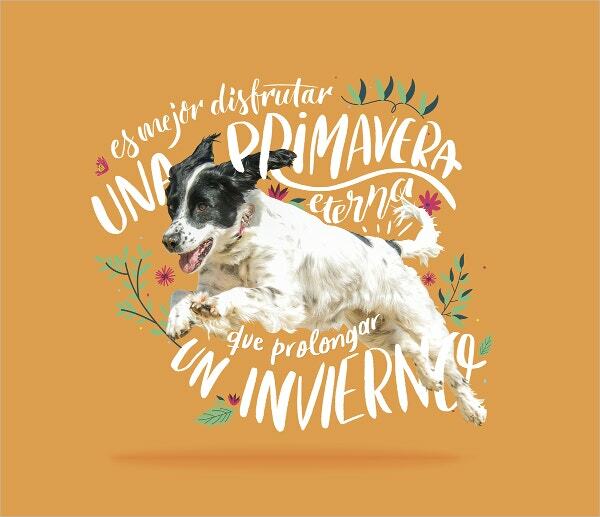 The template consists of handmade drawings of different pets with an attractive theme that displays the playful nature of your pet. 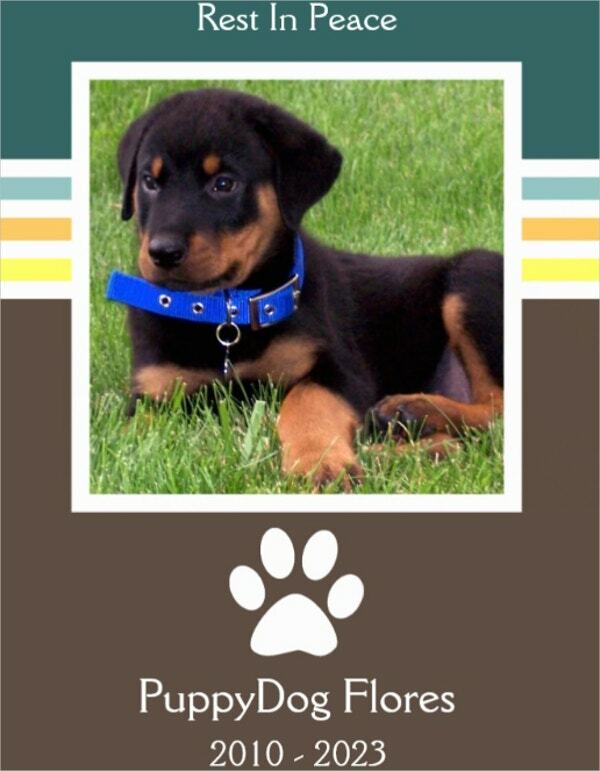 No matter what pet animal you have, you will always find a suitable funeral card template. A Teal textured background template with a movable frame. It’s the best way to organize your loving memories of your pet and share them with family and friends. The template is available in doc, ODF, Pub and Pages formats. > Who can use Pet funeral program templates? Pets are beloved members of the family and when they die, it is a traumatic loss. 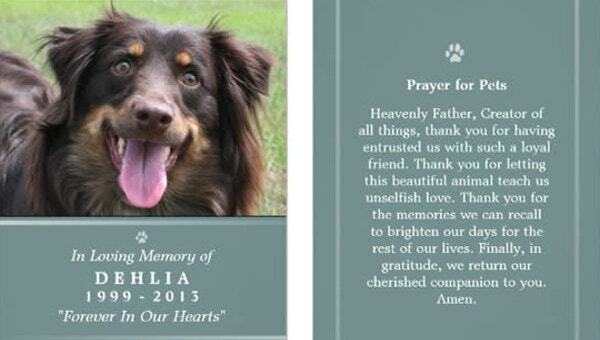 These templates can be used to plan a funeral program of your pet. Some of the templates in the above can also be used to create a memorial spiral book where you can stick memorable pictures of your pet which can be easily shared with your family and friends. The templates allow you to express you love and feelings for the pet whose physical absence is traumatic for you. > How pet funeral templates help in grief? For healing, it is necessary to deal with grief actively which only comes after the acceptance of the death of your beloved pet. 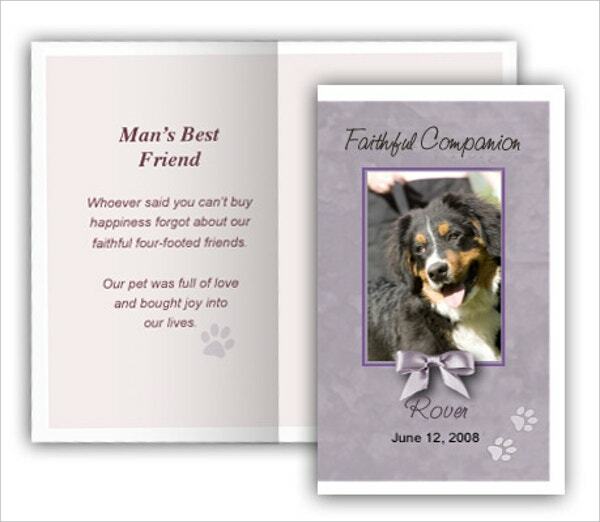 Pet funeral templates allow you to plan a funeral program for your pet which also shows your respect towards your pet. 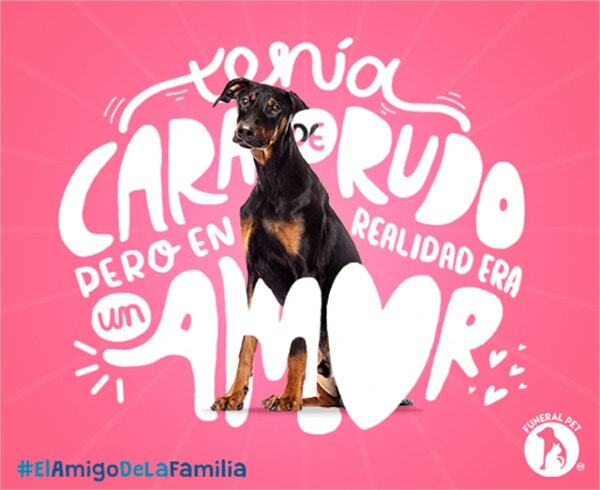 The template is designed in such a way that you can include several memorable pictures of your furry friend that show the loving bond with your pet friend. 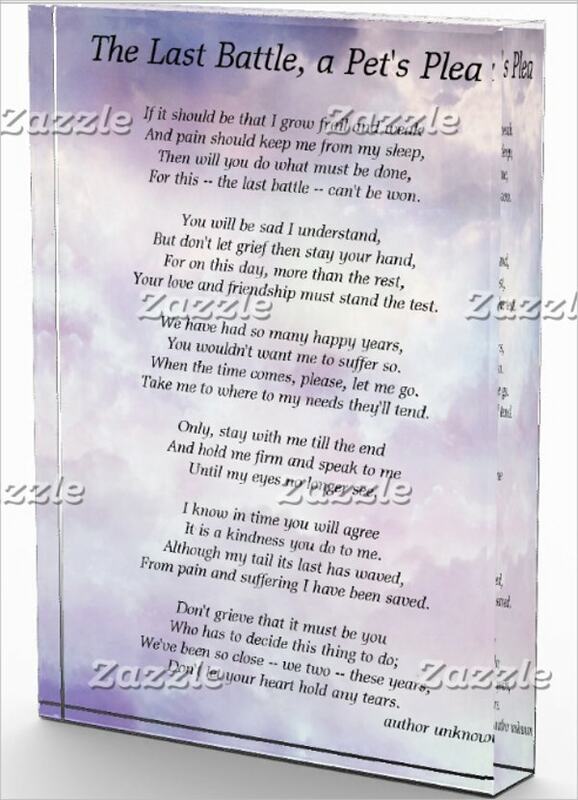 The templates help you in arranging a fitting farewell to your pet and help you in accepting the reality of life and death. > How Pet funeral templates are helpful? 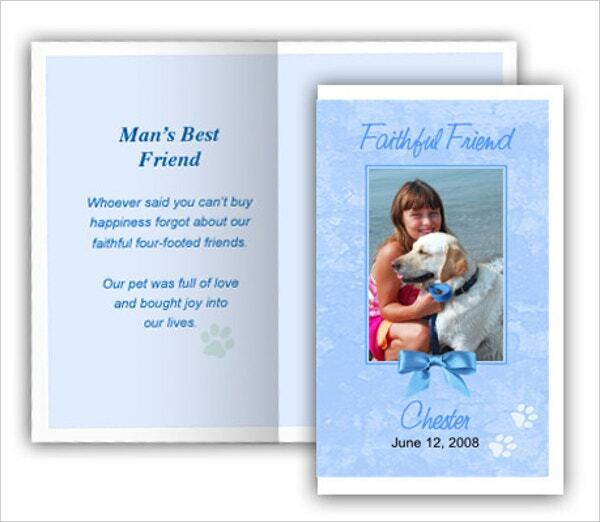 Pet funeral templates are readymade funeral program invites that allow you to arrange a funeral program for your pet. 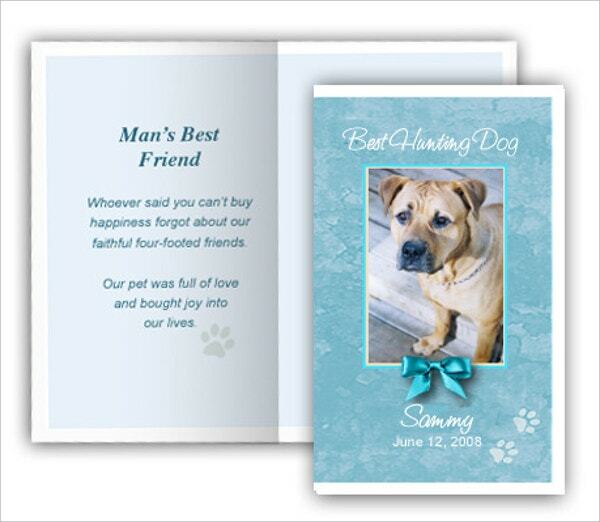 The templates allow a high level of customization which means you can alter any design element of the template to include memorable pictures of your furry friend. The templates act like a helping hand to make final arrangements for your pet.